You have just pulled yourself through some really difficult and exhausting Soul work, or maybe you are still in the thick of it and this is round two, or three or four! Whatever the case maybe, when you shift the level of your vibrational energy, which is what happens when you work through letting something go internally, at the light of the tunnels end you will receive the most precious gift of all, and that endowment will be known as ‘new awareness’. New enlightened consciousness is simply becoming more mindful and attentive to what surrounds us in our everyday life. Put it this way, what you perceived to be the truth about your life before your new awareness, is no longer the truth. This is very exciting, but not only breathtakingly thrilling, it is a game changer that has in fact already changed your understanding of what you hadn’t seen before. Soul work is bringing your attention to area’s of your life that are out of balance. Awareness is coming to the understandable realization of that which is out of balance. Working with the Soul is not easy, because more often than not we haven’t really had a chance to get to know her. Reuniting with our Soul perhaps we could say is like getting to know our twin sister/brother that we didn’t know we had. They look familiar but we really don’t know anything about them. We travel though life with a programmed formula that our Ego constantly keeps in check. Responsibility, honour and order is on the map and heaven forbid, we mustn’t steer of the path with our curiosity or consciousness, in case we get lost. 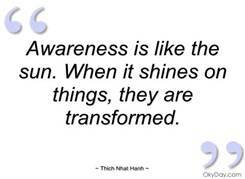 Awareness I have to say is everything. Once we become receptively wise and awake to another persons behaviours, actions and intentions we are able to make choices about that person from a more enlightened or lets say sharpened emotional place. What we hadn’t paid attention to before, we can no longer ignore. What you had unconsciously neglected to realize, and what has kept you out of balance, a position of unhappiness or even unwellness, has now exploded through the door of your expanded state of awareness, the flood gate of consciousness has opened. What you have worked really hard for is now inside of you for your appreciation going forward.